When I started to get sicker and sicker I stopped drinking soda, sugar and caffeine drinks all together and only drank water or decaf tea. Well after 5-6 years it kind of gets really boring and you crave a soda or something with a burst of flavor. I was drinking Kombucha and have written about it in the past. I also have been drinking a lot of sparkling water which is become more popular and now you can find many great flavor combos like watermelon and cucumber…etc. Walmart doesn’t carry them but Target and grocery stores do in many brands. Last year I began experimenting with making my own smoothies using my ninja mixer/blender. The great thing about smoothies is that you can make the smoothie to fit your dietary needs or nutritional needs using fruit, veggies or whatever you can have. You can use dairy, non-dairy, yogurt, ice cream, almond milk, cashew milk, water, coconut water….etc. I use jelly, jam, preserves or homemade jams and it really gives it a great flavor and texture with chunks of fruit. The sugar content depends on what you use so you can substitute with what you like or don’t like. Don’t be afraid to try anything in a smoothie, there are no rules. I add vanilla extract, cinnamon, maple syrup, nutmeg, honey, agave, strawberry jam, apple sauce, Greek yogurt, gogurt….whatever sounds interesting give it a try, don’t be shy. If there’s not enough liquid add more milk or water. The blend, I blend for 20 seconds or so. Should be pretty thick but half as thick as a milkshake. If you want it thicker add 2 bananas or try vanilla or plain yogurt. Enjoy! 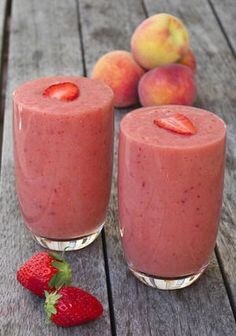 I like to use a mix of fresh with frozen fruit because the frozen fruit makes the smoothie more slushy and thicker. I use fresh strawberries since I don’t like my fruit overripe but I will add half frozen sometimes or all frozen if I’m out of strawberries. I use frozen peaches for the icy texture & peaches are hard to find year round. I use fresh bananas or frozen but I usually have a lot of bananas on hand. You can add pineapple slices for a nice tangy kick and for digestion. For a thick base I like to use a whole large banana or one and a half bananas if you like it thicker. I tried 2 large bananas and it was extra thick but the banana stole the flavor show. I prefer to use only yellow bananas and not ones with brown spots because the brown ones make it taste bitter or funky to me but if you like brown bananas give it a try. You can also add a dash of vanilla extract if you don’t have vanilla flavored milk or vanilla yogurt.